Everyone can relate to a day at work that just starts off on the wrong foot. Perhaps you have just had an argument with a spouse or loved one, or you’re late for an appointment even though you had a million reminders in your schedule, or your inbox contains e-mail after e-mail with what seem like impossible demands. These days can feel really long, and before you know it, the smile is wiped off your face, and you dread your next customer or colleague-facing interaction. In fact, you become filled with anxiety at the thought of your next appointment, and you realize that you have to get your act together. At first glance, this seems easy. Why not just refocus on positive things? Or, even better, try to reframe. “This day won’t last forever,” you think. Didn’t somebody tell you recently that you do have control over your thoughts when you are anxious or expecting the worst? Then how come this simply doesn’t feel easy when it is one of those days? 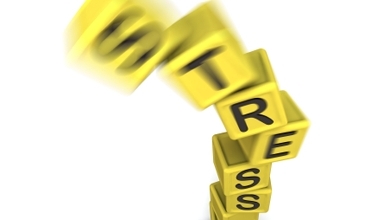 A study in Proceedings of the National Academy of Sciences by Raio and colleagues made in September, 2013 explained why, when your stresses build up, it becomes more difficult to get your anxiety under control. In a well-designed experiment, investigators found that people who had acquired a conditioned fear response (think Pavlov, or if that’s too obscure, think of “boss-panic” or “board meeting-freeze”) were able to suppress these associations and calm themselves down only if they did not enter the situation under stress. If they were already under stress however, this threw the “fight or flight” system off, and controlling their thoughts was much more difficult. When you’re having one of “those” days then, this stress can make it difficult to control your anxiety when you are dealing with your boss or board meeting. No amount of “one step at a time” or “control only what you can” reminders actually work. This is because when you’re stressed by that argument at home or the inbox that makes your stomach turn, this stress interferes with your ability to control your automatic negative expectations. Usually, this control relies on your prefrontal cortex (PFC), a brain region that is designed to manage your anxiety of anticipation without a problem. However, when your emotions are already in a boil because you have just come out of a heated situation, your PFC cannot function normally, and it fails you. So what? Why is this study important? Well, if you know that your day has started off on the wrong foot, then trying to control your PFC is probably not your go-to strategy. Rather, managing your anxiety with methods that bypass the PFC or do not require it, would be the way to go. These methods are much like mindfulness meditation, whereby instead of controlling your thoughts, you learn to let go of them. This is also called emotional introspection, and is thought to quiet down the brain’s anxiety center directly without controlling thoughts. When your anxious thoughts come at you, rather than grappling with them, you let them just be. Observe them. Notice them. And simply direct your attention to something other than your thoughts, such as your breath. This may not be easy at first, but if you are having one of those days, it is likely to be much more successful before any meeting that provokes anxiety in anticipation of it. Also, practice makes perfect. If you practice this method often, you are likely to get better at it over time. The moral of the story then is this: If you are having a stressful day at work or come to work in an irritable frame of mind and have to enter a potentially anxiety provoking meeting, “reset the needle” on your brain’s anxiety center by closing your eyes for 5 minutes and trying out the breathing technique I described above. It will likely be much more successful than trying to talk yourself out of your anticipatory anxiety or impending freak-out.